Frederick Douglass National Historic Site of Washington, D.C. is honored on a five-ounce silver coin released Tuesday, May 2, by the United States Mint. This collector coin is the second 2017-dated issue from the U.S. Mint’s series of America the Beautiful 5 Ounce Silver Uncirculated Coins and the thirty-seventh overall. It follows the 2017 Effigy Mounds silver coin, which was introduced in March. Coins of the series are made at the U.S. Mint facility in Philadelphia, bearing a ‘P’ mint mark and 3-inch diameter, from 5 troy ounces of 99.9% pure silver. Frederick Douglass National Historic Site was established in 1962 to preserve the home and legacy of Frederick Douglass, who was an abolitionist, civil rights advocate, author, and statesman. The silver coin’s reverse or tails side design, created by Thomas Hipschen, portrays Frederick Douglass seated at a writing desk with his home in Washington, D.C., in the background. Phebe Hemphill sculpted the artwork for use on coins. The design first appeared on the Frederick Douglass quarter, which launched into circulation on April 3, 2017. 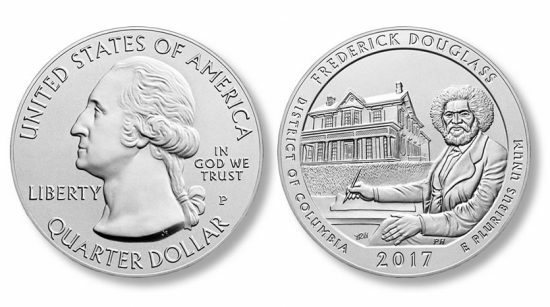 It and the five ounce coin have reverse inscriptions of FREDERICK DOUGLASS, DISTRICT OF COLUMBIA, 2017, and E PLURIBUS UNUM. Quarters bear reeded edges while edges of 5-ounce silver coins are smooth with lettering of “.999 FINE SILVER 5.0 OUNCE" to denote their composition and weight. The 2017-P Frederick Douglass Five Ounce Silver Uncirculated Coin is available for $149.95 from this U.S. Mint product page. The mintage for the silver coin is set at 25,000. A similar 5-ounce bullion silver coin has been available since April 3, 2017. It shares the same designs and major specifications as the collector uncirculated version but lacks a mintmark and has a brilliant finish. U.S. Mint sales of the bullion coin now total 18,400. Intended for investors, the U.S. Mint does not sell bullion coins directly to the public. Instead, they are released through a network of authorized purchasers for a small premium above their melt values. The coins are currently available for about $15 over their silver value, with discounts available when buying higher quantities. The next three silver coins in the 5-ounce series debut in intervals throughout the year.